The Committee on Capital Markets Regulation today released data on the total public financial penalties imposed on financial institutions in the United States for Q2 2016. Public financial penalties include public class action settlements that arise from class action lawsuits brought by the government (e.g., state attorneys general) and regulatory penalties that follow enforcement actions by regulatory agencies including the SEC, CFTC, and others. In the second quarter of 2016, total public financial penalties amounted to $6.2 billion, which is 21% higher than the $5.1 billion in penalties assessed last quarter, and is 76% of the $8.2 billion in penalties assessed in Q2 2015. To resolve charges that they misled investors in mortgage-backed securities, Goldman Sachs was subject to the highest penalty of the quarter, which totaled $5.1 billion. 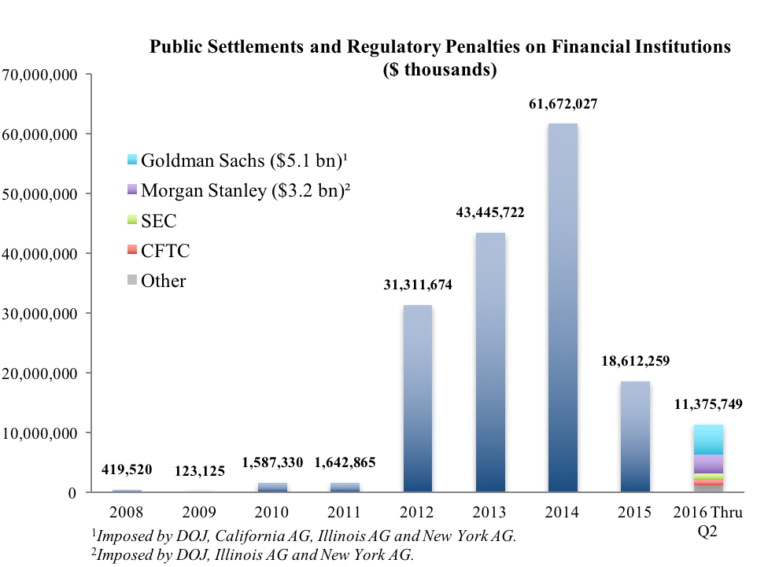 This is the greatest penalty imposed on a financial institution since 2014, when total public financial penalties amounted to a record $61.7 billion. The data show that financial institutions in the U.S. continue to face historically unprecedented public financial penalties.